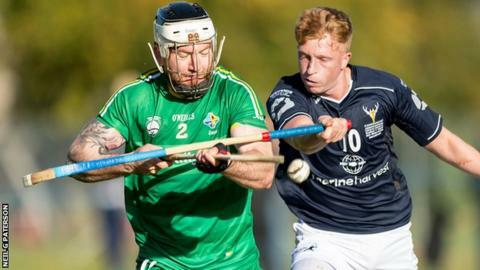 An outstanding first-half performance helped Scotland's shinty players to a 24-14 first-leg victory over Ireland's hurlers at Bught Park, Inverness. The Scots led 22-4 at half-time through goals worth three points apiece from Glen MacKintosh, Fraser Heath and Liam MacDonald. Playing with the wind, the Irish, inspired by Laois ace Zane Keenan, stormed back in the second half. But the Scots held on, with the return fixture at Croke Park on 21 November. It only took Lovat's Camanachd Cup final hero Kevin Bartlett five minutes to open the scoring with the first of a series of two-pointers over the bar from a free hit. Bartlett and Keenan sank two of these each to make it 4-4 before Scotland went on a scoring spree. Steven MacDonald sent another over the bar in advance of MacKintosh scoring the first goal with a shot from 10 yards. Liam MacDonald, one of two lower league players in the Scottish team, had just come on as a substitute when he got goal number two with his first touch and Heath brought Scotland's goal tally to three in nine minutes. A combination of wind advantage and a more robust approach helped the Irish in the second half. The making of the goal which started their spectacular comeback was a tribute to the broad face of the Irish hurly which Keenan used to scoop up a free hit before volleying the ball 100 yards into the Scottish goalmouth. There was rather less elegance to Shane Nolan's scrambled finish, but the Irish revival had begun. Bartlett did respond with what turned out to be Scotland's final two points before Keenan sank two more of the same and Nolan grabbed a second scrambled three-point goal. However, the Irish resurgence ran out of momentum and Scotland emerged as worthy winners. Ronald Ross had a long list of international appearances and goals before taking up the Scotland manager's job and this showing is right at the top of his list. "That was probably the best first-half performance I've seen from a Scotland team ever," he said. "We were fantastic at home here, played some great shinty and got the ball down and passed it. "In the second half we knew Ireland would come back at us since there was a strong wind, but we had some heroic displays today and it's great for our sport as well. It was a fantastic performance and I'm delighted for everybody." As Scotland prepare to move on from Bught Park (seating capacity 500) to Croke Park (seating capacity 73,500) in Dublin, the 40-year-old manager and scorer of over 1,000 goals may be contemplating a brief return to first-team club shinty. If Kingussie, winners of 23 league titles in 24 seasons up to 2009, lose to Oban Camanachd on 31 October, they will face a relegation play-off against Kilmallie and Ross, even if still injured, has pledged to be available. The Irish won the under-21 international 25-6 while there was a resounding 19-1 victory for the Scottish women in their Camogie challenge match against County Kildare. The decisive contributions came from two daughters of well-known shinty families when Lovat's Laura Gallacher scored three goals and Kirsty Delaney grabbed two.